Never Enough Nails: OPI Brazil Beach Sandies Swatches! I have been super excited about the OPI Brazil collection and so anxious to swatch it all. Of course, when I am most anxious, my Brazil polishes took FOREVER to arrive, probably because of the 89 snowstorms we've had recently! But, the preciouses are finally here and I couldn't wait to try the Liquid Sands from the collection. OPI calls these "Beach Sandies" and they come in a set of 4 minis. 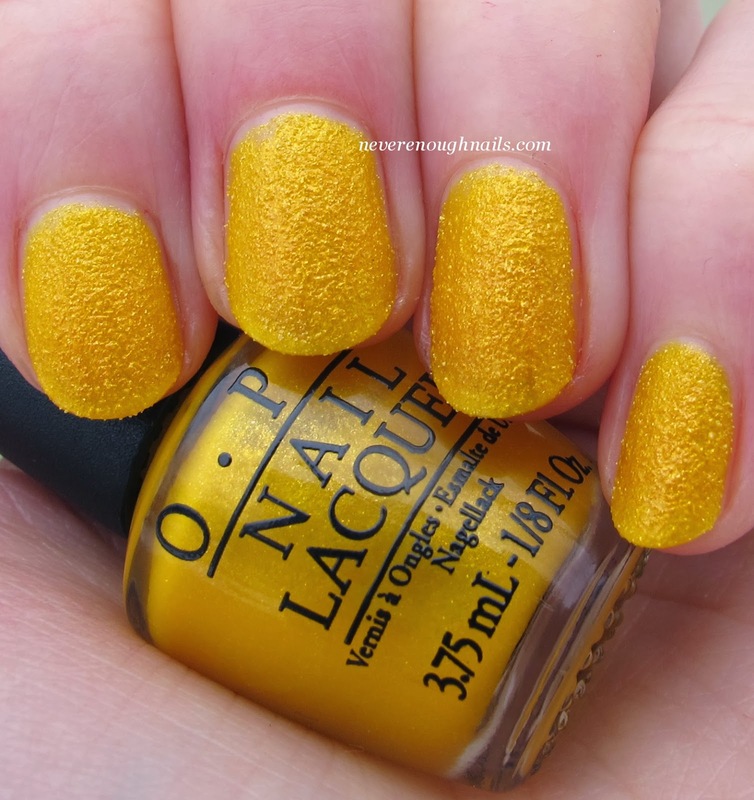 I swatched the bright lemon-y yellow first, OPI You're So Flippy Floppy. 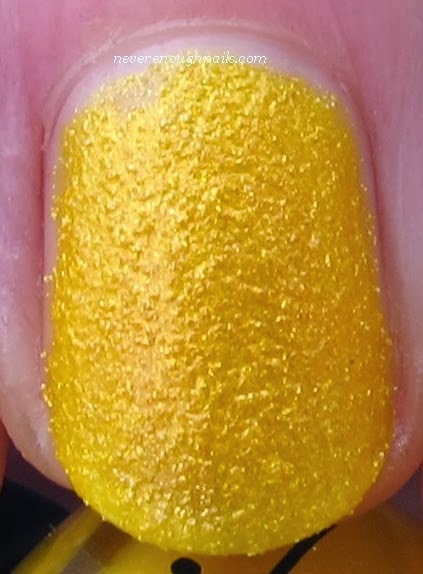 This yellow texture is gorgeous, it's a little deeper and richer than true lemon yellow. There aren't a ton of yellow textures around, so I'm pretty excited about this one! This is three coats and the formula was very typical of OPI Liquid Sands. I'm going to discuss it more at the end because all of these were pretty much the same. OPI Samba-dy Loves Purple is a pretty pinky purple texture. It's another Radiant Orchid color! It's much brighter and more pink than OPI My Current Crush, if you were wondering. Kind of like the summer version of that polish. Ahhhh, look at this gorgeous pool blue! OPI What's a Little Rain Forest? 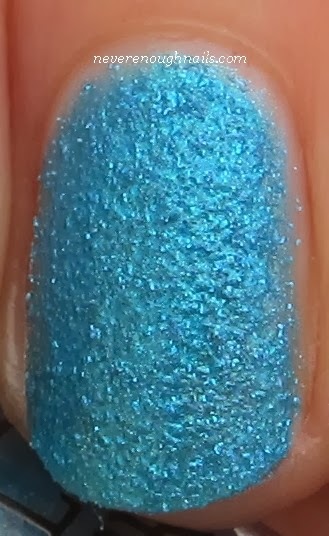 is a stunning cerulean texture, so bright and lovely for summer. I am in LOVE with this one! This is also three coats of gorgeousness. There must be something wrong with me lately, because I keep falling in love with the pink polishes in collections! OPI I'm Brazil Nuts Over You is a HOT flamingo pink texture. It has a little dash of red in it, like the flamingos have been eating extra shrimp. This is the kind of pink I can really get into in the summer. This is three coats, and this is really the only one here that maybe needed three coats. The others were all very pigmented and opaque in two coats, but I felt like the third coat brought out more of the texture and sparkle. I'm Brazil Buts Over You was just the teeniest bit less pigmented, but if you do thicker coats, it should be a two coater for you. The formula of these was great, easy to apply and control, not too thick or thin. If you already love OPI Liquid Sands, you will love these. Overall, I am totally smitten with all four of these polishes. I am still very much into Liquid Sands. They are the easiest thing to slap on when I don't have time for a whole base coat/three coats/top coat/quick dry top coat routine. Textures are the only reason I am able to keep my nails polished all the time and keeping them polished has really helped the health of my nails this winter. But enough about my Liquid Sand love! My one complaint about these polishes is WHY U NO FULL SIZE THESE PRETTIES??? The OPI Brazil collection is available now at Professional Salons, including Beauty Brands, Beauty First, Chatters, Dillard’s, jcp Salons, Pure Beauty, Regis, Trade Secret, ULTA and ulta.com. Beach Sandies Liquid Sand mini pack retails for $12.95 ($14.95 CAN). I agree about full size...why are they not available? I don't know MrsRexy, maybe they thought Liquid Sands aren't as popular now? But I'm still pretty obsessed with them!